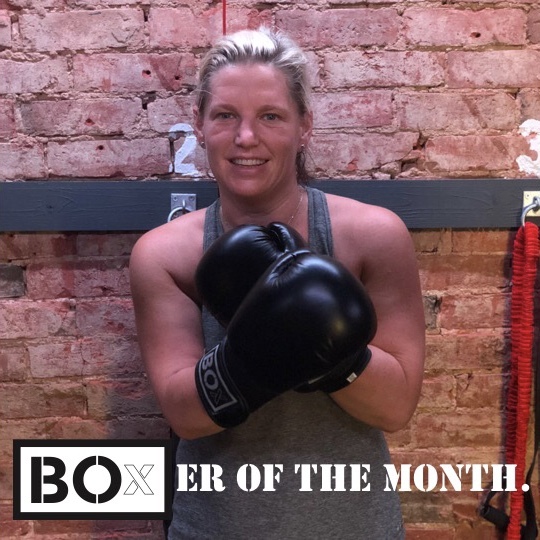 Our BOxER of the month in July was Sarah Rhodes. Have you had a back injury and required surgery, which lead to you feeling frustrated with getting fit again? Well Sarah didn’t; she’s a working mummy, and had injuries thrown at her but still manages to find the time and motivation to get up at 6.30am and attend sessions at least twice a week. We love BOxERS who give 100% effort. It’s about winning, and if you have the determination and drive, you’ll win and reach those goals. I started going to BOx not long after it opened. I’d heard about it and instantly wanted to try it, especially as I was training for a 50k ultra Marathon and needed more cardio and HIIT training. The strength and endurance I gained helped improve my running. I try to do 4 classes a week and my favourites are BOxTECH, BOxCORE, BOxHIIT and BOxBELL. Over the time I’ve been going I have seen great weight loss and toning. I love the spirit of camaraderie and feeling totally exhausted at the end. As a working mum BOx is my time, about me! I love it!